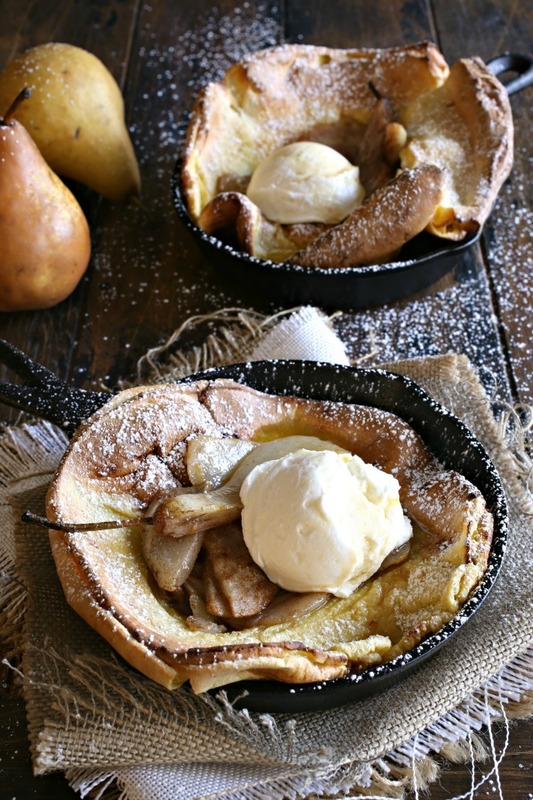 Let's talk about how much there is to love about Dutch baby pancakes. The puff, the flavorings and, my personal favorite, the fact that they cook in the oven and I don't have to stand over a griddle flipping batches of pancakes. The key to getting that huge puff is to make sure all your ingredients are at room temperature, your pans are screaming hot and your batter is very well combined. I filled mine with sauteed pears but balanced the flavors with cool labneh. 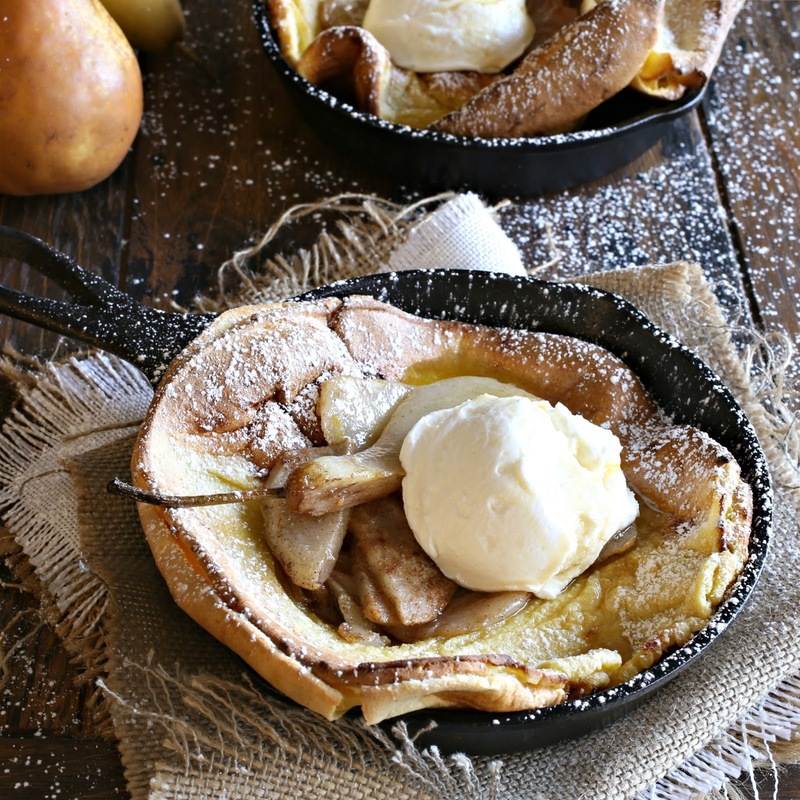 It's just a simple strained yogurt and it adds a delightful tang to the fruit and the pancake. When the pans first come out of the oven, the puff is huge but will soon deflate. You can definitely make one large pancake and serve slices but I think it's more fun to give everybody their own individual pan. A quick dusting of powdered sugar and you've got a breakfast to impress. Nobody needs to know how easy it actually is to make. Enjoy! To make the labneh cream, combine the yogurt and salt. Scoop the mixture into cheesecloth, place into a strainer over a bowl and let sit on the counter for one hour. Move the strained labneh to a separate bowl and swirl in the honey. 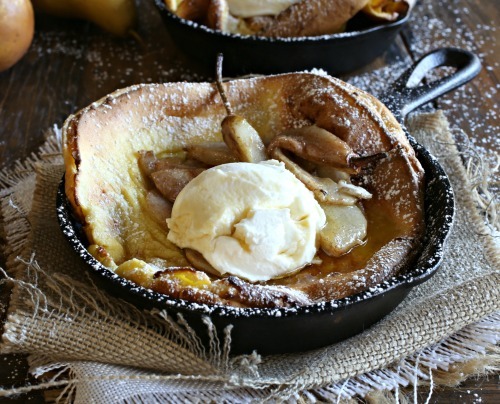 Add one tablespoon of butter each into two 6 1/2" cast iron skillets and place in the oven while pre-heating. By the time the oven is at temperature, the pans should be hot and the butter melted. In a large bowl, whisk together the eggs, milk, sugar, vanilla, flour, cinnamon and salt. You can also do this in a blender. Pour half the batter into each hot pan and return to the oven for 20 minutes. Turn off the oven but leave the pans in for an additional 5 minutes to set. 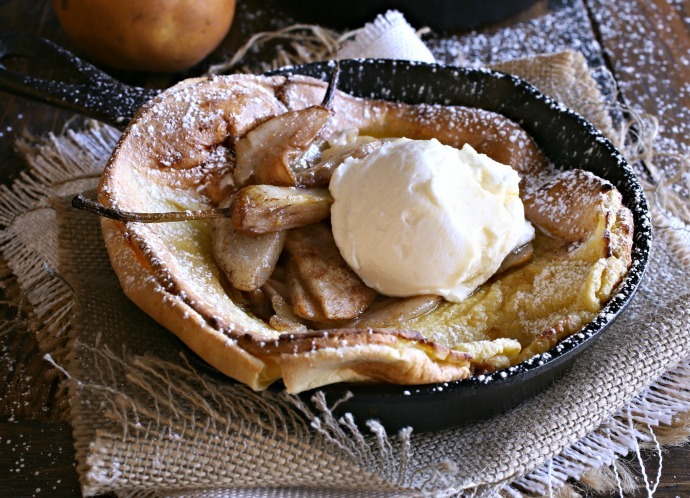 In a separate skillet, add the tablespoon of butter, pear slices and salt. Saute for a few minutes until the pear begins to caramelize. 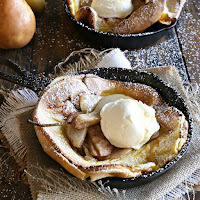 Serve each pancake with half the caramelized pears on top, a dusting of powdered sugar and a dollop of the labneh cream.